I’ve been debating for a few weeks now which silver bullion series I might want to focus on getting caught up on this year. The Kiwis and the Koalas have both been in contention. I’ve been a little reluctant to commit to building out the Koala set this year because I had the first four sets in the series in MS70 and, if I went for the rest of that set, I knew I’d probably want to continue with 70s. This is one of the few of these sets that I’d originally been going for in MS70 – the Kookaburras, Lunars and Pandas I was quite to content to build out mostly in MS69. I had been thinking, based on my memories from ’08-’10, that it would probably run me $70-100 a coin to build out the set in that grade and I just wasn’t sure I wanted to go in for that right now. I wasn’t fully convinced that it was worth that to me at this time vs other things I could be doing. I’ve always loved these large bullion coins for the designs, but I’ve really been getting into the 19th century European gold more as I get older and the two have to compete for funds. Just to see I’ve been watching on eBay to see what they’re tending to go for. To my pleasant surprise, while most are listing in the $70-100 range, as I expected, there are several dates available from various reliable sources in MS70 for about $50, which I’m more comfortable with. 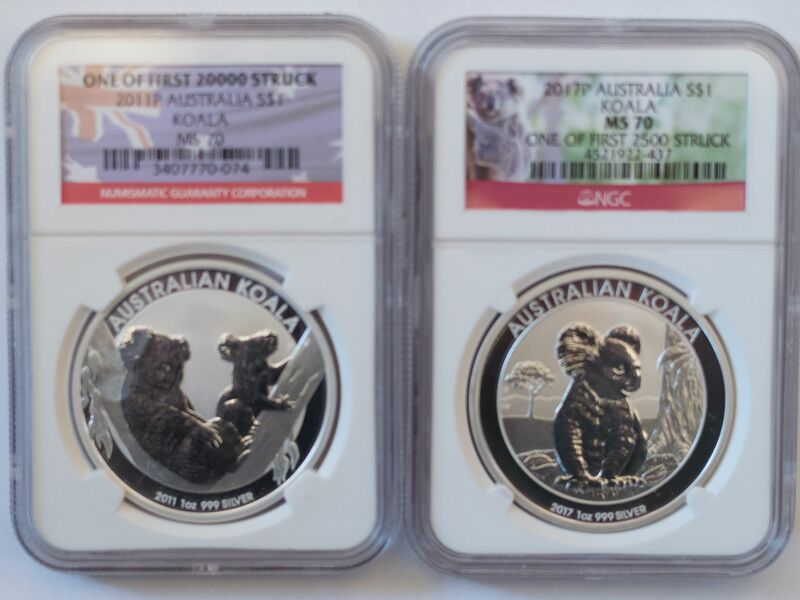 A couple of weeks ago, on Sunday the 6th, a seller I’ve bought from before listed seven 2011-P Koalas in MS70 for $38 each. It was a surprise seeing that because this dealer normally only deals in classic coinage – I’m pretty sure I bought my 1887 10G from them a few years back. Looking at eBay, these Koalas looked really out of place and were just about the only modern coins they were selling. I have no idea how they got these things in stock, but they priced them to sell – everyone else was asking at least $50 for the same thing. It can be hard to find dealers willing to sell graded MS69s for $35 or less. I had a $10 “eBay bucks” certificate that I had to spend before the month was over anyway and $38 is almost cheap enough to call an impulse purchase (I normally try to cap those at $25 though to be honest). But I thought about it for a little while and decided to pull the trigger. At that price, I just knew I wasn’t going to regret it even if I didn’t decide to make the Koalas a focus this year. Unless a seller listed one in an auction and I got lucky it was hard to imagine getting one any cheaper than that. $38 probably barely covers the cost of the coin and the grading, and it’s a guaranteed MS70. A few days later, around the time the 2011 coin was arriving in the mail, I noticed that there was not one, but four 2017-Ps selling in true auctions with very low starting bids that were all ending on Sunday the 13th. The four coins were selling in pairs. Each pair was being offered by a different seller. One pair was ending around 10:30 AM about a minute apart from each other. The 2nd pair was ending around 10PM, also very close together. A major dealer that I’ve bought from before was also offering the 2017-P with a BIN of $48. All of these had free shipping. Granted, people do crazy things all the time, but it seemed likely that the bidding would top out at or below $48. Assuming the people bidding (and there were about 10-12 people bidding on the various auctions) had done their homework / research, it seemed reasonable to think that no one would keep bidding once the price got close to $48 when there was a BIN option. Sheer number of coins selling that day and having that BIN serving as a ceiling seemed like a perfect recipe for suppressing the sale price and made it seem likely that a good deal could be had. Based on all of this it just felt like too good of an opportunity to pass up. So I decided to go for one of them. I decided I’d bid about $42 on the first of the four, see if I won. If I didn’t win, I’d immediately bid the same on the second. If I lost both, I’d consider bidding a little higher on the second pair. I figured I’d either get a reasonable deal (under $45) or I just wouldn’t bother buying today. Well… I won the first coin for just $34.89. The second coin sold a minute later for $34.00. The second pair ended at $33.20 and $38.00. So, I don’t know if my theory about the large number of coins proved valid in the end or if that’s just the price that the buyers on the Bay are willing to support right now. In about a week I’ve locked up two of the nine coins I was going to need to build back my Koala set for under $75. Not a bad run of luck. I don’t know if this quite locks me into / commits me to going after the Koalas this year, but I’m really close to it. With everything that’s going on lately I think there might also be a “retail therapy” aspect to these small purchases too, but fortunately I’m not going nuts – still very much honoring and sticking to my budget. Now I just need to stop getting distracted and get back to waiting to be ready to purchase that 20 Franc coin in a couple of months. Of course, I say that while knowing that an auction for a 2012 in MS70 is ending this weekend. The included pictures are just a quick attempt. Hopefully I’ll be re-shooting and uploading new pictures with all of these to match what I’ve gotten done lately for the 10G set, the Kiwis, and the Kookaburras. By the time you earn a Ph.D. you have long since given up arguing about whether or not you're a nerd. So true. Hopefully I'll have my official "nerd certificate" if you will by September. Kudos on the new purchases as well! The Koalas make a nice series. I think you made the right choice and jumped on a great opportunity! I love the Koala's. The hardest for me to find was the f12, and the 2013 chinese privy. Good luck on your set. I am not sure how long I want to hang on to my set. I don't really mess with the gilt versions, the proofs, or the privies. I think that's a way to go broke and die penniless. I enjoy the designs and getting them in Mint State. 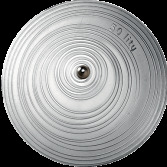 Which are your favorite one ounce silver bullion coins, from a design point of view? Purely on the basis of the designs, of the ones I have collected, I'd say the Kookaburras. 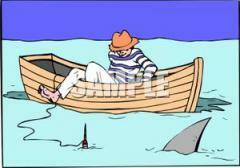 This is exactly how I acquired the 1947 and 1948 coins for my Curaçao/Suriname set. My main interest was in the 1941-45 coins minted for Curaçao/Suriname by the U.S. mint during WW-II, but when I saw an MS66 1948 5C up for auction I put in a conservative bid and to my surprise, I won it. A couple of months later an MS67RD 1947 One Cent went up for auction on eBay. When I looked it up in the NGC and PCGS population reports I realized it was the finest known graded example. How do you not bid on that? Right? The day after that, I also won an MS66RD 1948 2 1/2 Cent which has an NGC population of 3 with none finer. The rest followed in a similar fashion with all but one at or near the top of the NGC graded population. These coins of opportunity cost more on average than most of the coins in the set, but it seems to have worked out well since that set won a Best Presented Set award this year. My thanks to NGC for both awards this year!